Thank you for visiting Garage Experts of West St. Louis. 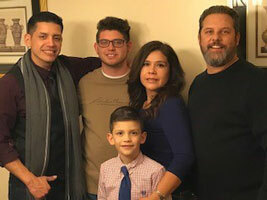 Locally owned and operated by Buff Family Enterprises, Inc. James and Norma Buff have resided in the St louis area for over 20 years with their three son’r;s Joe, Damian, and Gabriel. With a combined 45 years’r; of managing successful retail facilities, James and Norma decided to realize their dream of owning their own family business. Having a love for home improvement projects and a passion for excellence, Garage Experts was an obvious fit for the Buff Family. Combined with our attention to detail and customer focused care, you can count on a professional job done right and backed by a solid national brand. Call us today to schedule your Free estimate. We’r;ll provide a custom 3D rendering of your new garage, complete with epoxy flooring, custom cabinetry, slatwall, and overhead storage. All products are manufactured in the USA. We provide a quality, professional look and superior product you won’r;t find anywhere else. We are so confident you will love your new garage, we offer a Lifetime Warranty on the Garage FX flooring system and on all our custom cabinets. When you choose Garage Experts of West St Louis, you are supporting a local small business in your community. By working directly with the local owners, you can rest assured your satisfaction with the Industrial Strength Epoxy Concrete Floor Coating and Garage Cabinet installation is our number one concern. Call James and Norma today to learn more about how Garage Experts of West St Louis can help bring your vision for an ultimate garage makeover to life! GarageExperts of West St. Louis is your local garage makeover expert. View some of our recent work.